The Man of Steel meets his ultimate match when Doomsday comes to Earth — hell bent on destroying everything and everyone in his path, including the Justice League — in the all-new, action-packed The Death of Superman, part of the popular series of DC Universe Movies. Produced by Warner Bros. Animation and DC Entertainment, the feature-length animated film arrives from Warner Bros. Home Entertainment on Digital starting July 24, 2018, and on Ultra HD Blu-ray Combo Pack, Blu-ray Combo Pack and DVD August 7, 2018. 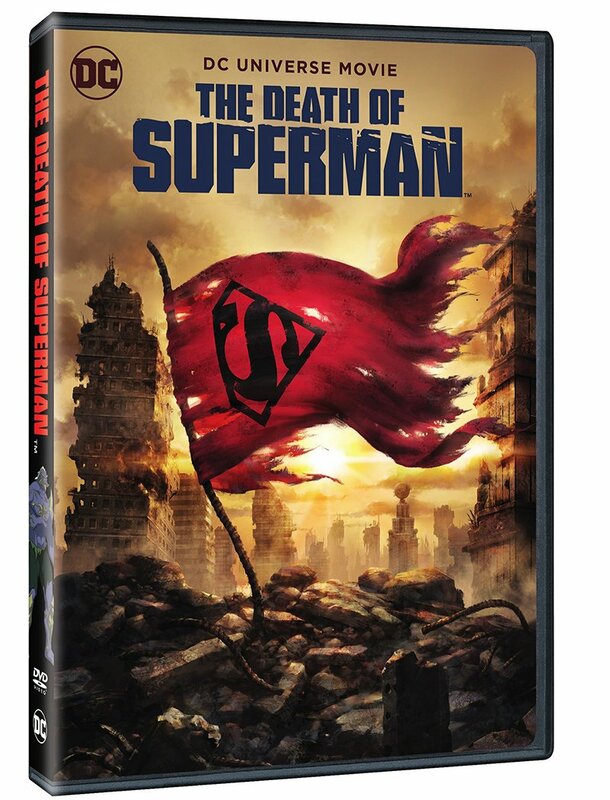 Check out the box art as well as the The Death of Superman trailer now in the player below! 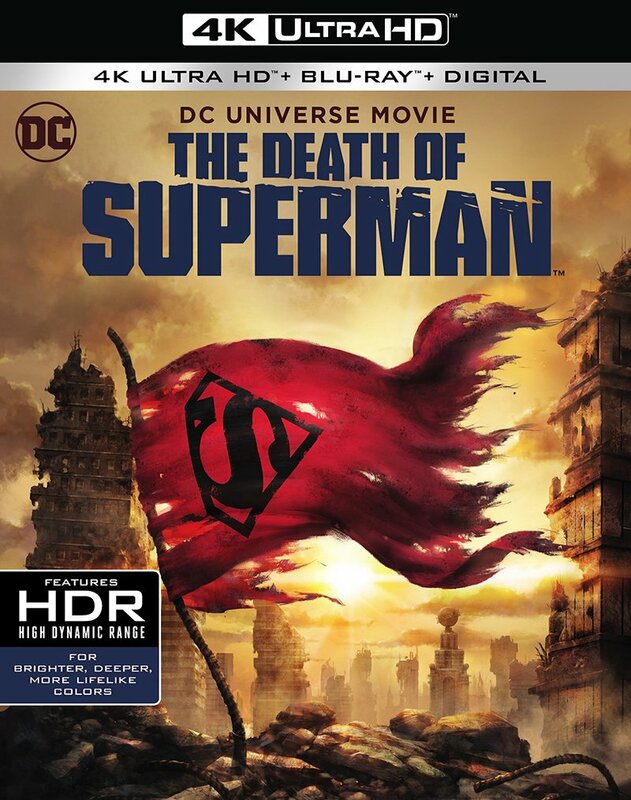 The Death of Superman will be available on Ultra HD Blu-ray Combo Pack ($39.99 SRP), Blu-ray Deluxe Gift Set ($39.99 SRP), Blu-ray Combo Pack ($24.98 SRP) and DVD ($19.98 SRP), as well as on Digital ($19.99 HD, $14.99 SD). The Ultra HD Blu-ray Combo Pack features an Ultra HD Blu-ray disc in 4K with HDR and a Blu-ray disc featuring the film. 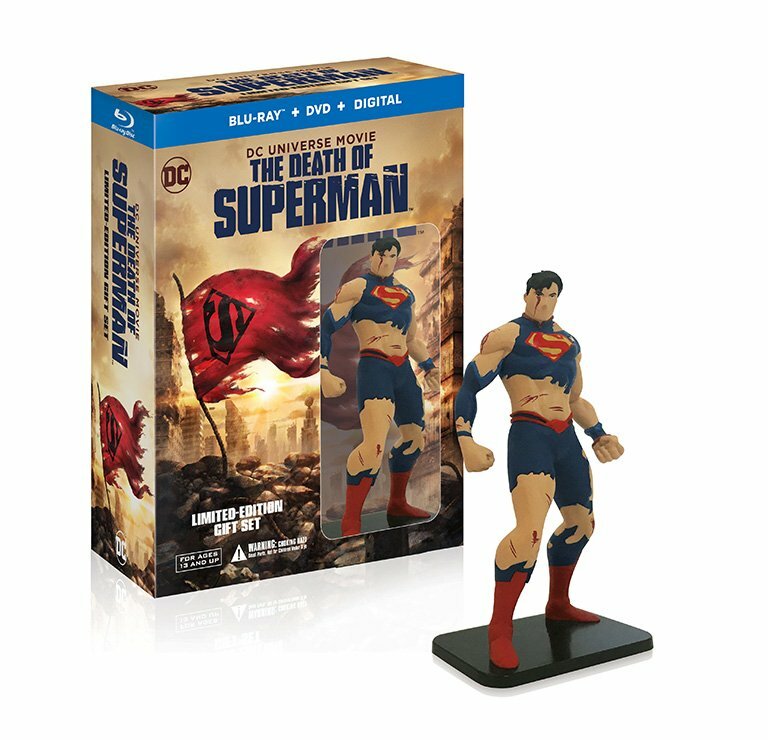 The Blu-ray Deluxe Gift Set includes a collectible Superman figurine and the Blu-ray Combo Pack features the film in hi-definition. The DVD features the movie in standard definition. The Ultra HD Blu-ray and Blu-ray Combo Pack include a digital version of the film. The all-star cast is led by Jerry O’Connell (Crossing Jordan, Stand By Me), Rebecca Romijn (X-Men, The Librarians) and Rainn Wilson (The Office) as the voices of Superman, Lois Lane and Lex Luthor, respectively. The potent trio is joined by the DC Universe Movies’ returning voices of the Justice League: Jason O’Mara (The Man in High Castle, Terra Nova) as Batman, Rosario Dawson (Sin City, Daredevil) as Wonder Woman, Shemar Moore (S.W.A.T., Criminal Minds) as Cyborg, Nathan Fillion (Castle, ABC’s upcoming The Rookie) as Green Lantern/Hal Jordan, and Christopher Gorham (Covert Affairs, Ugly Betty) as The Flash. Producer Sam Liu (Gotham by Gaslight, Teen Titans: The Judas Contract) co-directs The Death of Superman with Jake Castorena (Justice League Action) from a script by New York Times bestselling author Peter J. Tomasi (Green Lantern: Emerald Knights). Executive Producers are Sam Register and James Tucker (Suicide Squad: Hell To Pay, Justice League Dark). The Death of Superman: The Brawl That Topped Them All (Featurette) — Experience the battle between Superman and Doomsday like never before as creators of the iconic comic and the new film explore the nuances of “The Greatest Fight” with the help of a martial arts expert. 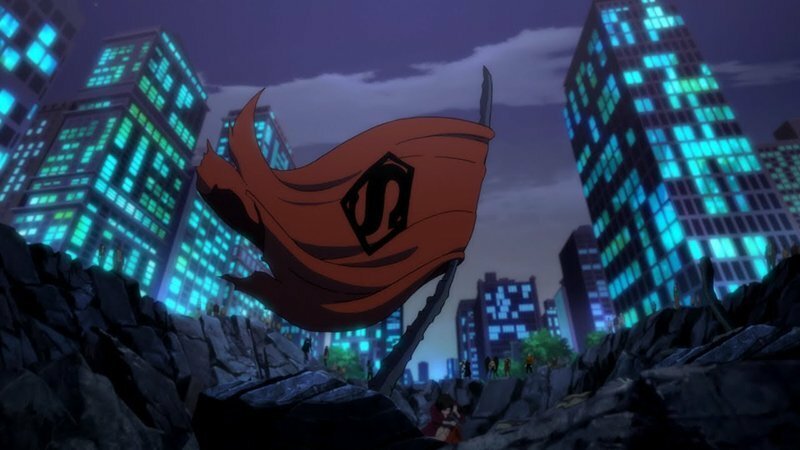 A Sneak Peek at DC Universe’s Next Animated Movie, Reign of the Supermen — An exciting look at the next film in the two-part saga that brings the epic and emotional story of a world without the Man of Steel to life. From the DC Comics Vault: Legion of Superheroes, “Dark Victory: Part 1” — After eliminating Imperiex, Brainiac 5 takes over his army and plans to take over the universe. With Superman thought to be dead, the other Legionnaires must stop him before it is too late! From the DC Comics Vault: Legion of Superheroes, “Dark Victory: Part 2” — The Legion faces Imperiex in a final battle, while a traitor lurks in their midst.